Around the internet, I tend to find articles on specific areas of pay per click advertising such as CPC, CTR or the landing page. In no way am I saying this is a bad thing. If it wasn’t for these articles, us advertisers wouldn’t be able to tweak their campaigns to help them run smoother. However, there are sometimes on the internet when you just want to have all the information there in front of you to read. Even if its in general, it can still have the potential to benefit you specifically. Sometimes, all it takes is an overview of a situation to locate the source of problem. PPC (pay per click) is a form of online advertising created by Google Adwords in 2000. Since then, Google Adwords has become around 95% of all Google’s revenue. PPC works around an advertiser and publisher side. The advertisers have their adverts featured on the publisher’s website. When the advert is clicked, the advertiser pays the publisher for getting that click (and Google a bit too). There are many types of landing pages an advertiser can choose for his campaign. Publishers are constantly finding the ‘right’ combination of size, colour and types of adverts to produce the highest CTR (click through rate) and therefore maximum revenue. Advertisers look at ways to increase their CTR although some advertisers see the price they pay for clicks (CPC) as more important. PPC is known for being quick and easy to use with minimal start up fees. PPC was a revolution to advertising introducing a direct link between traffic and cost. Before, all there was was banner advertising. Nowadays, there are millions of users (both advertising and publishing side) that use PPC to monetize their websites and gain traffic. PPC advertising fluctuated very much due to its easy user-ability of the program and the increase in users online. There are many PPC programs out there now such as Google AdWords and Ad Dynamo. PPC has produced such high results that some keywords have reached staggering prices of $55. PPC has had the benefits of the boom in social media to provide even more traffic to advertiser’s landing pages. PPC has become so popular that it is now the preferred method of online advertising. With Google starting off the market of PPC, there are now many alternatives to AdWords with companies chasing down the success of AdWords. There you have. A few bullet points about PPC that will hopefully give you a better insight into the world of PPC. The links to some of the bullet points are definitely worth reading too. They are all valuable articles which will benefit you more specifically looking into key areas of PPC. I hope this article makes clear that a general education of PPC is just as important as a specific education on different areas in PPC. When is The Best Time to Post Social News and Blog Content? 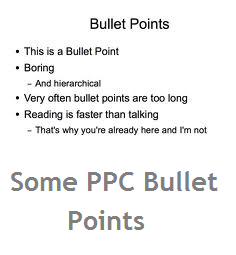 Share your comment 1 responseTO Some Bullet Points About PPC. Hi, good work – thank you Will. Just want to point out that Google didn’t invent PPC – Overture did, later acquired by Yahoo! in 2003. Then Google paid Yahoo a ~$230Million settlement prior to their IPO.